How much do Royals suites cost? 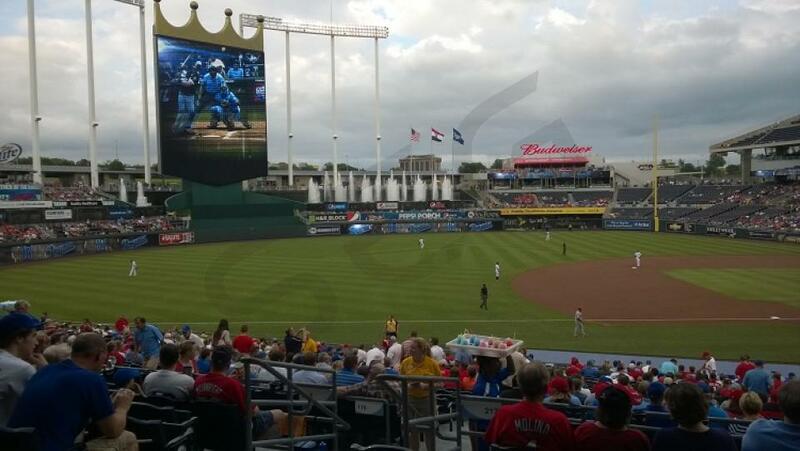 Kauffman Stadium suite prices typically range from $2,500 - $4,000 for Kansas City Royals games. Signature suites are the most popular suite option. Prices for these Royals suites will vary based on opponent, day of the week and suite location. Luxury suite prices for concerts and other events at Kauffman Stadium can vary widely based on the type of event. 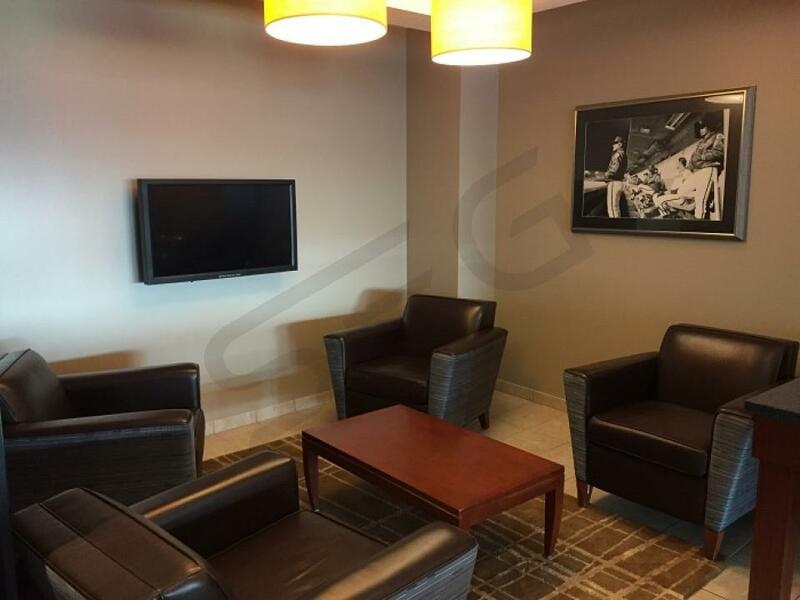 A Kansas City Royals Signature suite features HDTVs, interior lounge seating, exterior premium seating, in-suite catering options, upscale furnishing and a dedicated suite attendant. A Royals suite will include 20 tickets and 4 VIP parking passes. With your Royals suite, guests get exclusive access to VIP lounges and private entry into Kauffman Stadium. Signature suites are very spacious inside with balcony seating extended from the suite. Dugout Suites are situated right next to the Royals and Visiting dugouts, on the field level. There is no better seat in the stadium! Each suite can accommodate up to 35 guests and includes a private restroom and wet bar. Triple Crown Suites are located right behind home plate and have the best views in the stadium. Inside the suites, they are also very well appointed, featuring high end leather chairs and quartz countertops in a spacious setting. Triple Crown Suite ticket holders will have access to Kauffman Stadium's VIP clubs and private entrances. In this section we’ve compiled key considerations when planning an event in a suite at Kauffman Stadium. Kauffman Stadium luxury suites vary in size and configuration. Traditional private suites are located on one main suite (club) level wrapping around the ballpark. Traditional suites have a capacity of 20 guests. Kauffman Stadium also offers Dugout Suites, located on field level. Dugout suites can accommodate groups of 20-30. Kauffman Stadium has larger group party suites located in the outfield that can accommodate groups up to 75 guests. 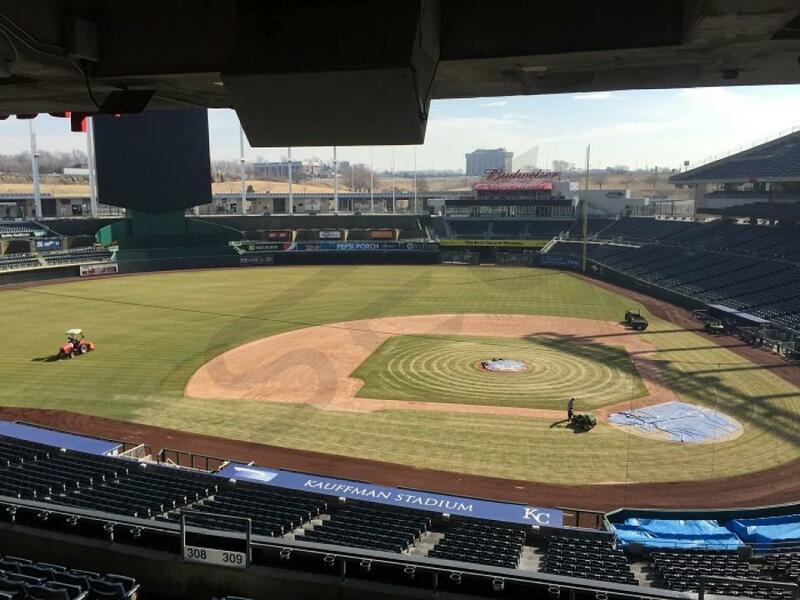 Kauffman Stadium suite prices typically range from $2,500-$4,000. 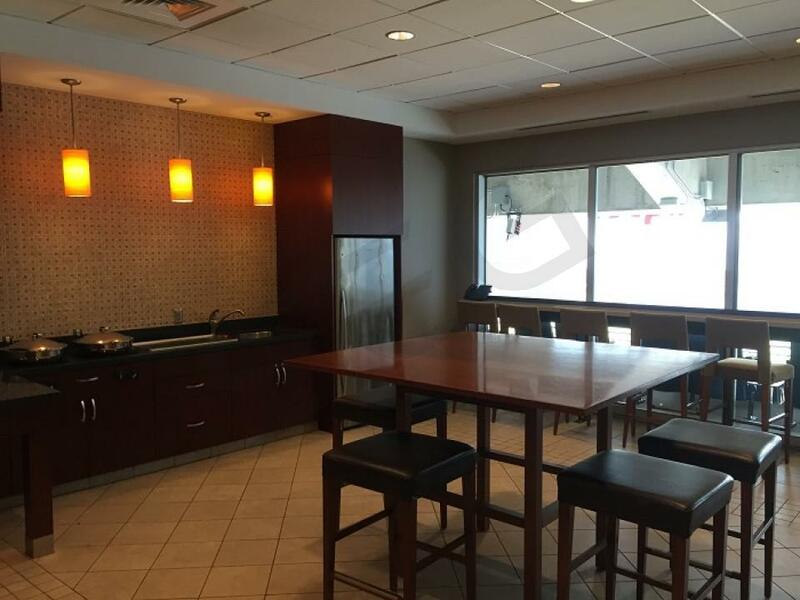 Royals rental suite pricing will vary based on opponent, day of the week, and suite location. Suite Experience Group can help you determine which game will fit your budget. 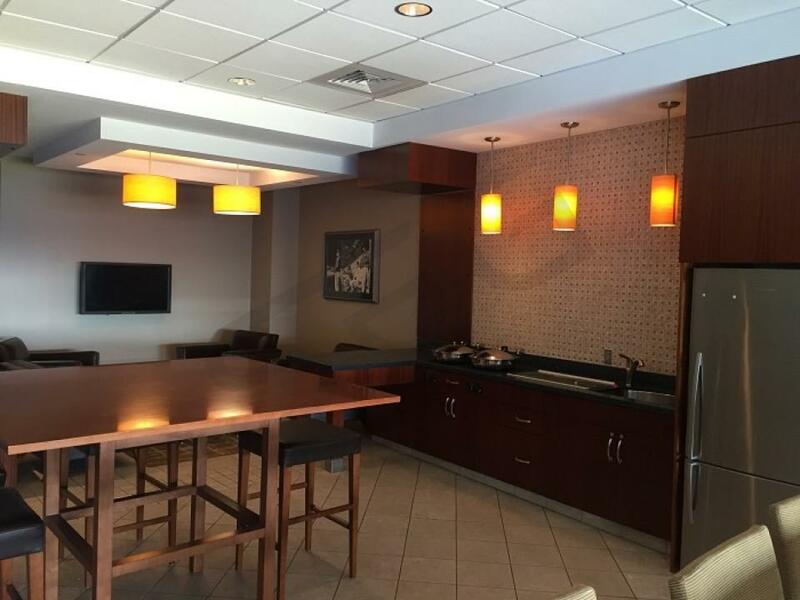 In-suite catering is available for all suites at Kauffman Stadium. The menu includes premium food and beverage options provided by Levy Restaurants. Most suites at Kauffman Stadium will not include catering in the base price of the suite, so be sure to allocate additional funds if you would like to cater your suite. A typical group spends an average of $100 per person on in-suite catering. The bill can go even higher depending on the group size and the amount of alcohol consumed. Suite Experience Group will provide a Kauffman Stadium catering menu and can advise on the appropriate budget and catering order for your group. Signature Suites – Signature Suites features interior lounge seating, exterior balcony seating, upscale furnishings and a dedicated suite attendant. Signature Suites typically include 20 tickets and 4 VIP parking passes. Other amenities include private restrooms on suite level, access to VIP clubs/lounges and private entrances. Dugout Suite – Dugout Suites are situated right next to each dugout and located on the field level. Dugout Suites can accommodate up to 35 guests; they include a private in-suite restroom and wet bar. Triple Crown Suite – Triple Crown Suites are located right behind home plate and have the best views in the stadium. Inside the suites, they are also very well appointed, featuring high end leather chairs and quartz countertops in a spacious setting. All Star Suites – All Star Suites are located right off of right field and come with the option to expand your group size from 20-150 guests. All Star Suites are perfect for entertaining a larger group in a party-room atmosphere with indoor and outdoor seating. There is no dress code enforced on suite level at Kauffman Stadium. Bags, Purses, and Backpacks cannot exceed 16” x 16” x 8.” Read the full policy here. Children 32 inches in height and under do not require a ticket to enter Kauffman Stadium. Fold-up strollers must be stored under your seat or may be checked into any Guest Services office. Kauffman Stadium has 14 parking lots in total. Suites at Kauffman Stadium will come with parking passes valid in designated VIP lots. You can follow the directions on those passes to identify the best entrance for your particular suite. Larger groups wishing to travel to the stadium together often opt for a bus. Busses (Oversized Vehicles) and RV's cost $20 and $25 respectively. Kauffman Stadium encourages vehicles dropping off a guest to enter the complex through either Gates 3 or 4 and to let the traffic directors know they wish to drop-off a guest. The car will be directed to Gate D and can drop off at the curb. Stadium gates will open 90 minutes before the first pitch for suite ticketholders. This is generally the case for other events at Kauffman Stadium as well. The VIP Entrance is located on the west side of Kauffman Stadium. The 2019 Kansas City Royals know all signs trend upwards for their 2019 outlook. The Royals are putting last season behind them and focusing on the positives that came out of it. That includes the progression of young star Adalberto Mondesi. Mondesi can attack opposing teams with both power and speed giving the Royals a potent weapon in their lineup. Another key player that has Royals fans excited is pitcher Brad Keller. Keller will look to build upon his rookie season and become a fixture in the Royals rotation for years to come. A key offseason addition was outfielder Billy Hamilton. Hamilton is arguably the fastest man in baseball and is one of the most talented defensive players in all of baseball. The Royals lineup will be built around their stars: Whit Merrifield, Salvador Perez, Alex Gordon and Jorge Soler. The rebuild in Kansas City continues in 2019 but with some strong years from their key players, the Royals could surprise people in the AL Central division. The Royals pitching staff will be focused around their young stars Jakob Junis and Brad Keller. Danny Duffy has a down year in 2018 but a bounce back in 2019 could help solidify this pitching rotation. The Royals signed closer Brad Boxberger and Drew Storen in the offseason to help strengthen their bullpen. The waterfalls at Kauffman Stadium are a sight to see but it’s the Royals’ luxury suite options where people want to be. Signature suites at Kauffman Stadium wrap the infield with Dugout suites down each baseline. Most Royals suites will accommodate 18 – 20 guests. If you have a larger group than that, the popular Dugout suites is where you’ll want to be. Pricing for a suite at a Royals game could range from $2,000 - $4,000 for the Signature Level and then $3,500 - $8,000 for Dugout suites. Along with VIP parking and a suite attendant, fans will have the opportunity to have their suites fully catered from the Kauffman Stadium catering department. 2018 will be a rebuilding year for the Kansas City Royals, who saw much of their 2015 World Series championship core depart in free agency. Despite losing Alcides Escobar, Eric Hosmer, Mike Moustakas, and Lorenzo Cain, there are reasons to be optimistic in Kansas City for 2018. This Royals roster is built around a group of scrappy young players looking to prove their worth in the big leagues. There is no doubt that the leader of this team is All-Star catcher Salvador Perez, who won the World Series MVP award during Kansas City’s historic 2015 season. Gold Glove left fielder Alex Gordon will look to bounce back from a down year at the plate, while Jorge Bonifacio and Whit Merrifield will aim to build off of their strong 2017 campaigns. Both Bonifacio and Merrifield’s production came as an unexpected surprise last year. Veteran Brandon Moss is a more than capable source of power and first baseman to act as a placeholder for Kansas City in 2018. Some top prospects to look out for in 2018 are Hunter Dozier, Bubba Starling, and Richard Lovelady. Before getting hurt for much of 2017, Dozier was a monster at the plate in the minor leagues. As for Bubba Starling, he struggled for much of his minor league career before finally starting to put everything together last season. The Royals hope he can show glimpses of his potential in 2018 as Lorenzo Cain’s replacement. And lastly Richard Lovelady has the potential to become a dominant left handed option in the bullpen for manager Ned Yost. 2018 will be an important year in terms of developing young prospects at the major league level. Behind Danny Duffy in the starting rotation, the Royals will rely on improvement from veteran starters Jason Hammel and Ian Kennedy. Fireballer Kelvin Herrera will once again man the ninth inning for Kansas City. 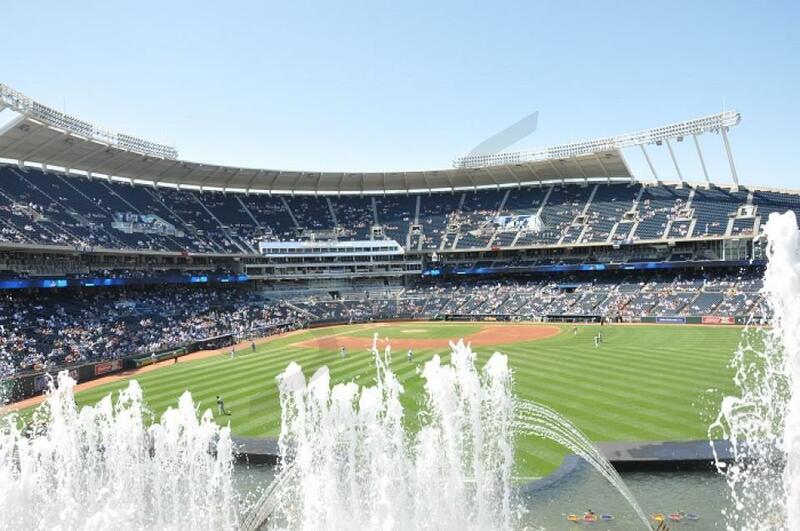 Watch the Kansas City Royals at Kauffman Stadium in one of Kansas City’s top luxury suites. A Royals suite features first-class amenities such as HDTVs, interior/exterior seating, in-suite catering options and a dedicated suite attendant. With a Royals luxury box, guests will also receive VIP parking, private entry into Kauffman Stadium, and exclusive access to VIP club areas. Most Kansas City Royals suites includes 20 tickets and 4 VIP parking passes. The Kansas City Royals enter 2017 with high expectations buttressed by their recent playoff success. 2016 was a subpar year with the Royals finishing an even 81-81. In 2017, the Royals return the majority of their offense. Lead by homegrown talents, Mike Moustakas and Eric Hosmer, the Royals lineup will again rely on contact hitting and high on-base percetanges. Behind the plate the Royals return All-Star catcher, Salvador Perez. Perez has solidified himself as the league's top defensive catcher. In the offseason, the Royals dealt All-Star closer Wade Davis to the Chicago Cubs in exchange for OF Jorge Soler. Soler has a high ceiling as run-producing corner outfielder, but his inconsistent plate approach needs to be refined. Kansas City is banking on his development to provide energy at the back-end of their order. The Royals also acquired utility player, Brandon Moss, to fill the void of losing Kendrys Morales. While Moss doesn't hit for average, he provides plenty of power; Moss finished last season with 28 home runs for the Cardinals. Kansas City's season will most likely depend on the success of their starting pitching. While rather unproven, the Royals starting rotation of Danny Duffy, Ian Kennedy, Jason Vargas, Nathan Karns and rookie Matt Strahm should keep the Royals in games. With the loss of closer Wade Davis, flame-throwing righty, Kelvin Herrera steps into their closer role. Watch the Kansas City Royals at Kauffman Stadium in VIP style in a luxury suite. A Royals suite features first-class amenities such as HDTVs, interior/exterior seating, in-suite catering options and a dedicated suite attendant. With a Royals luxury box, guests will also receive VIP parking, private entry into Kauffman Stadium, and exclusive access to VIP club areas. Most Kansas City Royals suites includes 20 tickets and 4 VIP parking passes. The defending World Series champions have no reason to believe they can’t get back into the World Series in 2016. If the Kansas City Royals get back into the World Series again, that would make three straight appearances. Manager Ned Yost is proving to be one of the best managers in baseball. In 2016, he’ll push to get a little more out of his squad as they lost some key additions from last year in Johnny Cueto and Ben Zobrist. To replace Cueto, the Royals did sign veteran Ian Kennedy. Kennedy will join Edinson Volquez, Yordano Ventura and Danny Duffy in the rotation. Ventura didn’t quite live up to his expectations a year ago but the young starter is a prime candidate for a bounce back season. The Royals have one of the league’s top bullpens led by their setup man, Kelvin Herrera and closer, Wade Davis. Davis stepped in for the injured Greg Holland and had a fantastic season. The Royals have a very balanced lineup filled with speed and power. Eric Hosmer and Kendrys Morales are the big bats in the middle of the order. Lorenzo Cain has blossomed into a player that can potentially hit 20 home runs and steal you over 25 bases. Alex Gordon has resigned with the Royals. Gordon is one of the best leftfielders in all of baseball. Salvador Perez is known for being one of the better hitting catchers in the league. The rest of the lineup will feature Mike Moustakas, Alcides Escobar, Jarrod Dyson and Omar Infante. With most of these players getting better with each year, the Royals could see 5 players reach twenty home runs or more in their lineup. Watch the Kansas City Royals at Kauffman Stadium in VIP style. Rent a luxury suite for the Kansas City Royals on a game-by-game basis. A Royals suite features first-class amenities such as HDTVs, interior/exterior seating, in-suite catering options and a dedicated suite attendant. With a Royals luxury box, guests will also receive VIP parking, private entry into Kauffman Stadium and exclusive access to VIP lounges. A Kansas City Royals suite includes 20 tickets and 4 VIP parking passes. A Royals suite at Kauffman Stadium is the perfect setting for any occasion. The Kansas City Royals enter 2015 as the team to beat in the American League Central. After reaching the World Series last season, the Royals have trumped the Detroit Tigers as AL Central favorites in 2015. Another postseason run for the Royals isn’t out of the question at all. The Royals were one game away from become World Series champions in 2014. The Royals reached the postseason for the first time in 29 years. Although they finished second in the AL Central, they were the number one Wild Card team after finishing with an 89-73 overall record. In 2015, the Royals have made some significant changes to their roster. They signed pitcher Edinson Volquez, designated hitter Kendrys Morals, outfielder Alex Rios and pitcher Kris Medlen. The Royals did lose a few key players due to free agency in Nori Aoki, James Shields and Brett Butler. Volquez will replace Shields nicely. Morales will also fit in well in replacing Butler and Rios is an upgrade compared to Aoki. The Royals will lean on their stars if they want to get back into the playoffs. Alex Gordon has MVP potential and is one of the Royals’ main leaders in the clubhouse. Eric Hosmer is still blossoming into a star. Hosmer hit just 9 home runs last season but really came on during the playoffs. Hosmer hit .351 in the postseason compared to .270 during the 2014 season. The Royals have plenty of players who can steal bases, something the team relied on heavily throughout last season. Those players include Lorenzo Cain, Alcides Escobar and Jarrod Dyson. The Royals have one of the best offensive catchers in the game in Salvador Perez. The Royals are going to turn to their young pitching star, Yordano Ventura, to lead their staff. Ventura is known for throwing heat and striking out batters. Ventura was one of the best rookies in the league last season and should improve in 2015. Following Ventura will be Volquez, Jason Vargas and Danny Duffy. The bullpen is led by closer Greg Holland. Holland has an excellent supporting cast in Wade Davis, Kelvin Herrera and Luke Hochevar. Manager Ned Yost has the Royals on the right path to success. Thank you for signing up for specials at Kauffman Stadium. Enter your email address below to stay in touch. We'll sign you up for our newsletter, which will inform you of the latest inventory and events at Kauffman Stadium. We promise we will never sell or distribute your information. 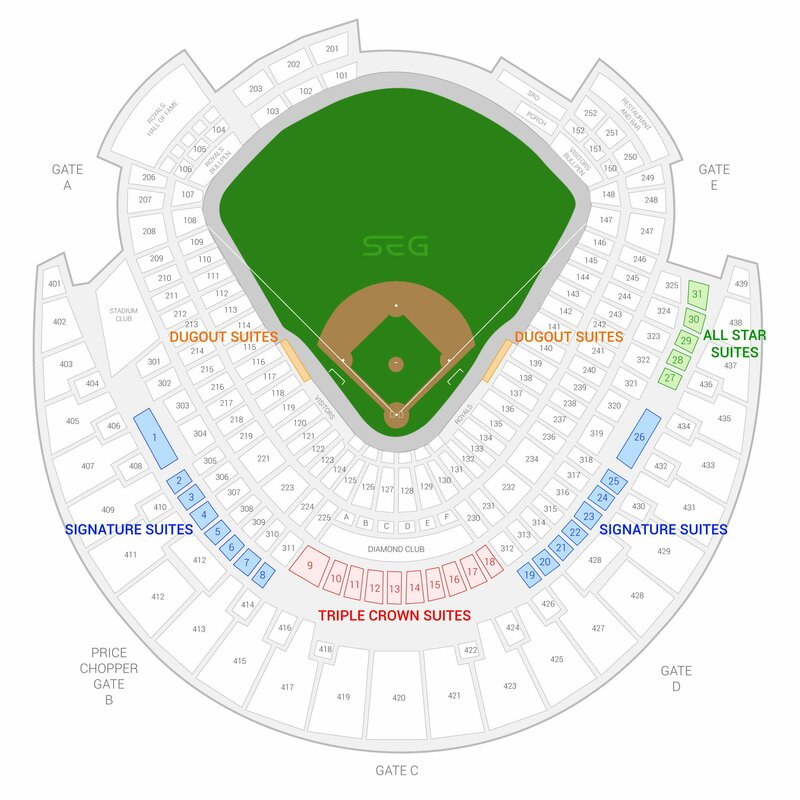 The seating chart below shows where the Kansas City Royals suites at Kauffman Stadium are located.